Worry convinces us there's danger, and then tricks us into getting into fight, flight, or freeze mode -- even when there is no danger. 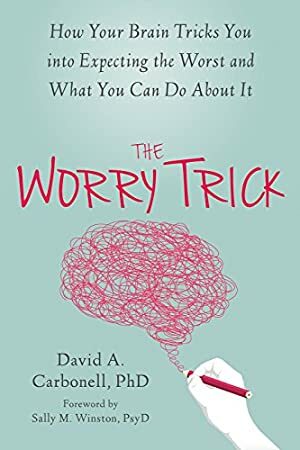 The techniques in this book, rather than encouraging you to avoid or try to resist anxiety, shows you how to see the trick that underlies your anxious thoughts, and how avoidance can backfire and make anxiety worse. If you're ready to start observing your anxious feelings with distance and clarity -- rather than getting tricked once again -- this book will show you how. Track It. This book has been £7.00 within the past year. Log In to track David A. Carbonell on eReaderIQ. to be notified each time the price drops on any book by David A. Carbonell. to stop tracking David A. Carbonell. Log In to track Sally M. Winston on eReaderIQ. to be notified each time the price drops on any book by Sally M. Winston. to stop tracking Sally M. Winston. We started tracking this book on December 26, 2015. This book was £11.23 when we started tracking it. The price of this book has changed 240 times in the past 1,213 days. The current price of this book is £10.12 last checked one hour ago. This lowest price this book has been offered at in the past 90 days is £7.95. This lowest price this book has been offered at in the past year is £7.00. The lowest price to date was £7.00 last reached on November 6, 2018. This book has been £7.00 one time since we started tracking it. The highest price to date was £12.66 last reached on January 13, 2019. This book has been £12.66 one time since we started tracking it. We last verified the price of this book about one hour ago. At that time, the price was £10.12. This price is subject to change. The price displayed on the Amazon.co.uk website at the time of purchase is the price you will pay for this book. Please confirm the price before making any purchases.